Our expert data integration services combines the data stored in various unrelated sources and provides a unified view of enterprise data to end user through SSOT (Single Source of Truth) by putting them in one silo. This helps to unearth critical information hidden in the data that often used to go undetected. With years of experience, our developers are expert in working with ETL (Extract, Transform and Load) tools. 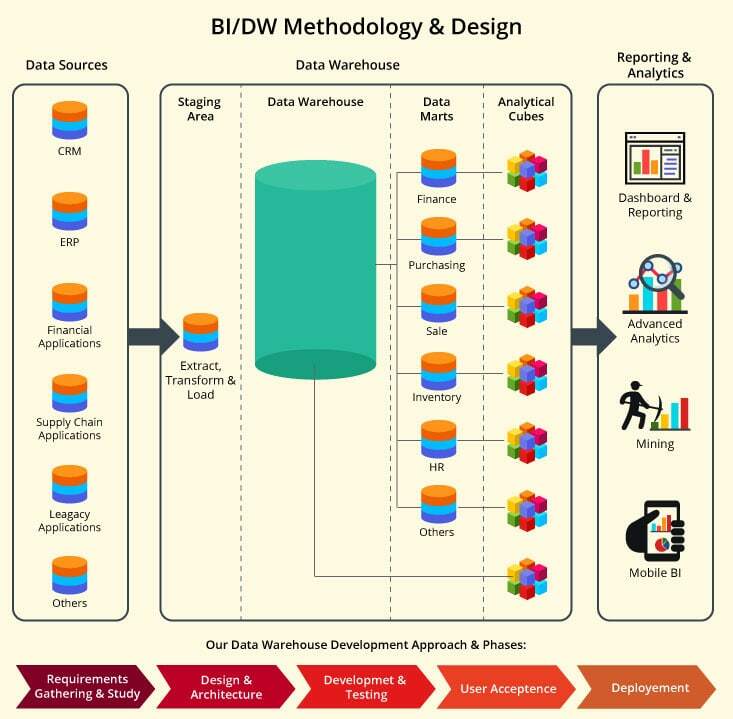 Design and architecture of data warehouse to meet the needs of business, and IT users. With our architecture and design services, we help to identify business opportunities, examine current data warehouse maturity, build business case and define a roadmap to ensure the data warehouse continually meets business needs. We help you centralize your data by creating enterprise data warehouse through data mart consolidation or migration from another platform. Our developers are also experienced in building individual data marts dedicated separately to each business function, addressing all the needs of a specific team or department. Integration, validation, management and protection of data from the point of origin to its eventual discontinuation. Discovering business critical information from raw data, and assistance with forecasting, decision support, application development and implementation for both operational and strategic users. 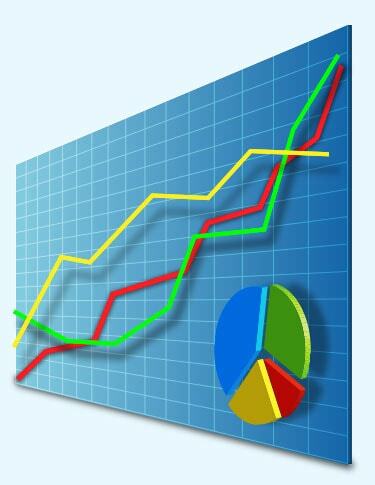 We help you optimize your system through performance and capacity analysis. Also, with the implementation of workload management tools, and application tuning techniques, we improve your data warehouse performance. With the utilization of field-tested data warehouse processes, and specialized tools, our experts manage & monitor the daily tasks that are required for maintaining an optimum data warehouse environment. Successful BI partnerships with companies from diverse industries such as health care, retail, manufacturing, higher education, social networks etc. Data warehousing is the backbone of any business intelligence solution and it needs to be built with careful consideration to be scalable and evolve as your business grows. It also requires a systematically built and easy to maintain ETL process. Congruent aids you in planning, designing and implementing an effective database solution to keep you way ahead of your competitors. With data coming in from various disparate sources and in different forms, it is important to have a Data Warehousing development partner who has deep understanding and experience of working with various source systems as well to enable faster and effective development of the data warehouse. Congruent thoroughly studies your current systems, business needs to understand what you are trying to achieve with the data warehousing solution and what level of reporting and analytical capabilities you expect of it.  Congruent is technically equipped to deliver a world class business centric database solution to meet your current and future requirements for gathering & presenting business intelligence to users.